A new show will be on at Carter Observatory starting on November 21st. We Are Aliens explores the possibility of life existing elsewhere in our universe through a new 360 degree digital planetarium show. Find out about what we are doing to search for alien life and whether scientists think they will find life on other planets or not. Visit this site to watch the show’s trailer. For Harry Potter fans you’ll be pleased to know that the show is narrated by Rupet Grint, who plays Ron Weasley in the HP movies. Sit back in Carter Observatory’s indoor planetarium and enjoy the show! Ticket and more info here. A solar eclipse can be one of the most dramatic of celestial events and there’s one happening on November 14th. An eclipse occurs when the Sun, Earth and Moon are lined up and we see the Moon to crossing in front of the sun. It looks like the sun is blacked out for a moment while the moon is in front of it. The upcoming eclipse is a partial solar eclipse in New Zealand (the moon wont cover the whole sun, just a bit of it). But the further north you go the more the moon will appear to cover the sun. To see a full eclipse you’d need to be 1200kms north of New Zealand, sitting in a boat in the pacific ocean (or around where Cairns (in Australia) is). 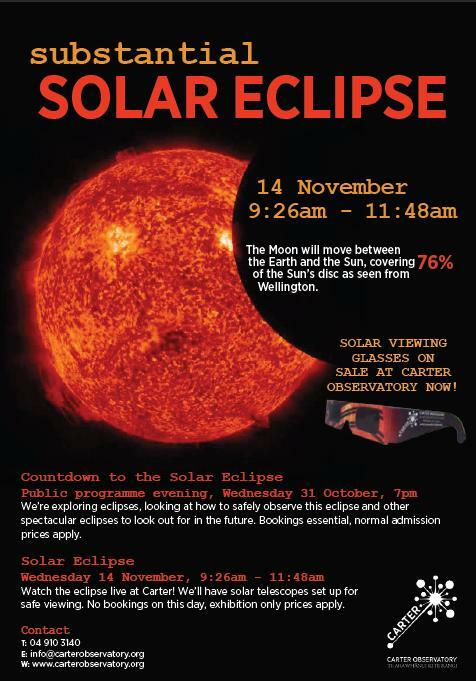 The eclipse in Wellington will be on Wednesday November 14th between 9.26am – 11.47am, with the largest portion of sun covered (about 76%) at 10.34am. Check out what the Carter Observatory has planned for the eclipse, lots of fun and learning! Interested in Astronomy? This book has heaps of projects and things you can make and do about astronomy. Have fun spaceheads! Free open day at the Carter Observatory! If you enjoyed the Cosmodome and other astronomy-related happenings last year, then head up to the Carter Observatory this Saturday. The Observatory is reopening with a huge range of things to do on its first day: take a virtual tour through space at the new planetarium, discover the Universe through NZ’s largest telescope, or just join in with one of the many fun things that are planned. For more details of what’s happening see the Carter Observatory website. This month’s theme is astronomy, so come to the Central Library at 7pm this Friday (the 3rd of April) for cool stories about stars, planets, space and maybe a martian or two. This is no April fool! All stories@7 fans will tell you the Central Library is the place to be on the first Friday of every month (at 7pm of course).